Collectors of Armed Forces Memorabilia, please refer to 'Armed Forces' page for detailed lists of available patterns. The unique full 3Dimensional, hand crafted, hand painted Crests, set on polished natural timber, have since been sought after by a wide range of organizations with pride in their own Crest / Coat of Arms. Products shown are as examples of our work and the wide range catered for. No endorsement by the relevant organization is implied. 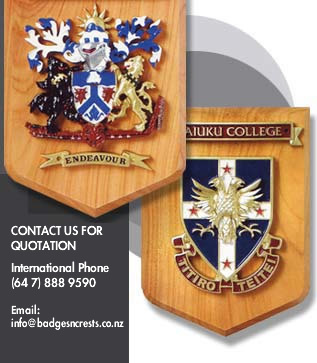 BADGES: In a variety of formats to match clients crests, are a logical extension of the services offered. Or completely separate designs.